The Holiday Season is upon us and it is important to ensure that Christmas and New Year are a happy and festive time for everyone, including your pets. Here are a few tips and recommendations to help keep your pets out of trouble this festive season. If you have a real tree, ensure you clean up the tree needles regularly. 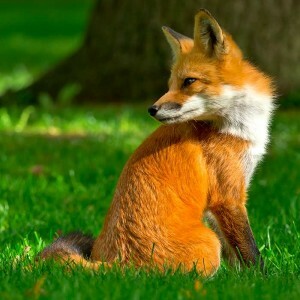 They can be sharp and easily get stuck in your pet’s paws or throat. Anchor your Christmas tree securely so it doesn’t tip or fall over. This video may make you giggle…as long as it’s not your Christmas tree and your pet getting in trouble! Putting the Christmas tree in a corner may help to block it off from your pet’s wanting eyes. Cover the tree water so your pet can’t spill or drink from it. This water can contain fertiliser and bacteria that can cause your pet to be nauseous or get diarrhoea. Hang your Christmas tree decorations up high so your pet can’t reach them. Pets love to play with baubles and tinsel but they can harm your pet’s digestive system when ingested. Baubles can also break and hurt your pet. Avoid using tinsel especially if you have cats and use only unbreakable baubles. 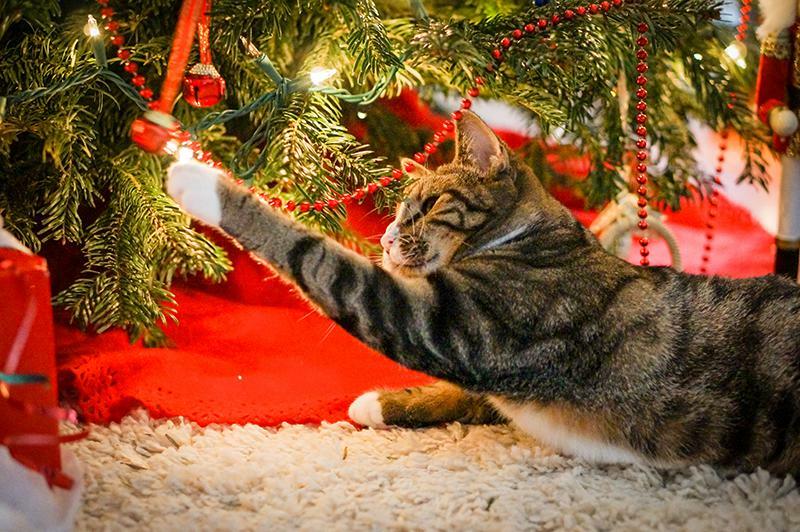 Read more ideas on how to cat proof your Christmas tree. You could always erect a little playpen or fence around your Christmas tree to get your dog to stay away from the tree and presents. 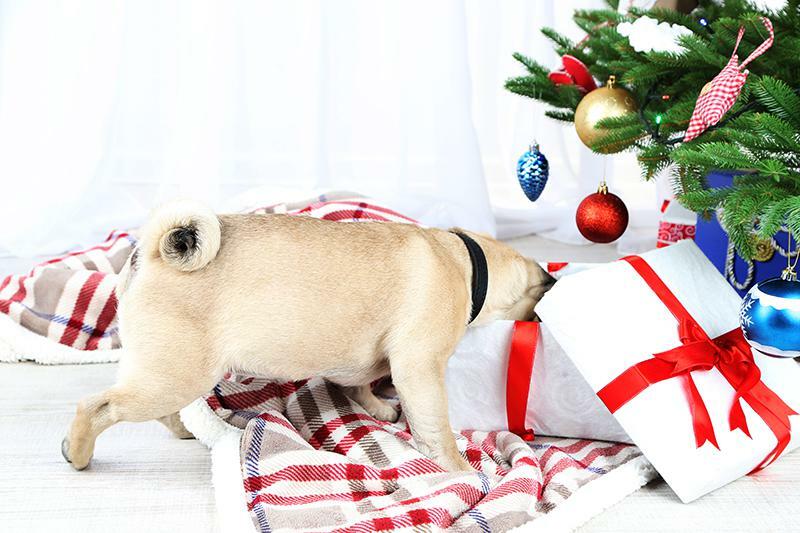 Put Christmas decorations, presents and wrapping items out of reach of your pet. Many cats and dogs love to investigate and play with ribbons and wrapped Christmas presents. Eating ribbons and paper can cause harm to your pet’s digestive system. Ingesting small items and kids’ toys can cause harm to your pet’s intestinal tract. Don’t leave lit candles unattended. Pets may knock them over and cause a fire or burn themselves. Use an appropriate candleholder and make sure candles are placed on a stable surface. Put the candles out if you leave the room, even if it’s only for a short time. Avoid mistletoe and holly. Mistletoe can cause gastrointestinal upset and cardiovascular problems. When ingesting holly, your pet can suffer from nausea, vomiting and diahorrea. Most lilies are poisonous to pets too. Rather opt for artificial plants made of silk and plastic, or choose a pet-safe bouquet. Protect electric cords and flashing tree lights so your pet can’t chew them and electrocute itself. Spraying citronella on cords and the plastic parts of lights will often help to keep your pet away. No alcohol for your pet. Keep alcoholic drinks out of your pet’s reach. Alcohol can make your pet weak and it could even cause them to go into a coma, possibly resulting in death. Keep the chocolate and sweets away. 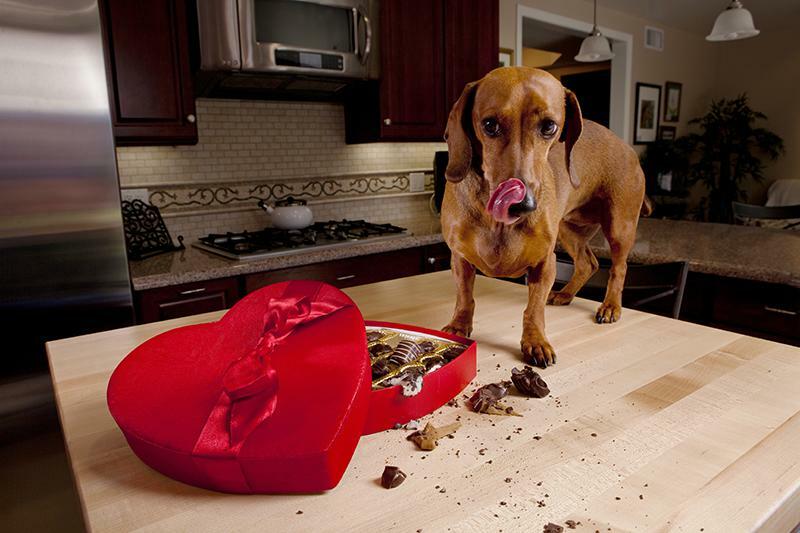 Chocolate and the sweetener Xylitol (found in many candies and gums) are poisonous to pets and can lead to death. Please keep all plates with Christmas sweets and chocolates away from your pet. Or put them in a snap lock container that your pet won’t be able to open. Leave the leftovers. Don’t feed your pet any of the leftovers. Our food is often too spicy and fatty for our four-legged friends and can cause problems ranging from an upset stomach to pancreatitus. Any cooked bones are a no-no as they can splinter, and even small bones can cause tearing of the intestinal tract. Pet-proof your garbage. 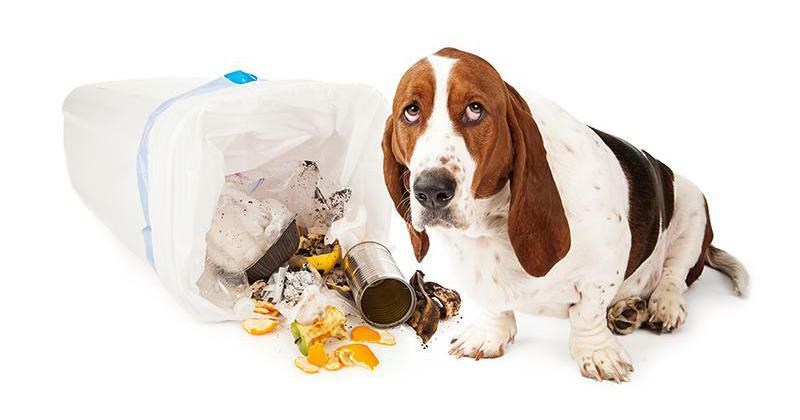 Garbage can smell very yummy to your pet and can contains all sorts of hazards, so make sure you put garbage away immediately and that your pet can’t access it. Give your pet some space of its own. A busy house full of guests and people that are strangers can be a bit overwhelming for your pet, and for some pets even scary. 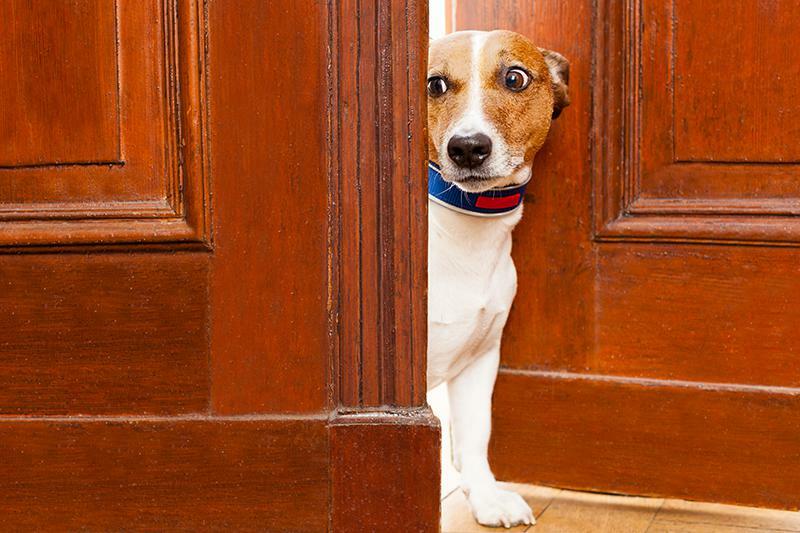 Your pet may try to hide or may be a bit over-stimulated, like children get if there is too much going on. If so, it’s a good idea to give your pet a chance to rest and chill out by putting them in a room by themselves with something nice to chew or to play with, some water and their bed.  Sometimes a boarding kennel or using a pet sitter may be the better alternative for your pet and your peace of mind. If your guests and their children want to interact with your pet, make sure your pet is comfortable with it. Ask your guests to be gentle with your pet. Dogs often don’t feel comfortable with being stared at, hugged or patted on the head, but may appreciate a scratch under their chin or a belly rub. Brushing up on your pet’s obedience training a few days before the visitors arrive can be very helpful to make sure your pet is on its best behaviour for the festivities. Share your pet house rules with your guests. This includes rules like if your pet is allowed on the couch, if certain rooms are off limits, to stay away when your pet eats its food, and so on. Keep your pet away from confetti and crackers. You don’t want them to ingest confetti or small items from crackers. Tell the kids not to scare your pet by throwing crackers at it. 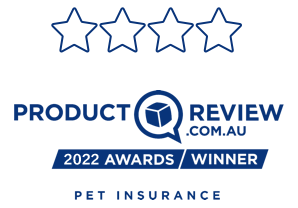 Protect your pet from loud noise and Fireworks. Dogs and Fireworks are often a dangerous mix as they can be very scary for your pet and possibly damage its sensitive ears. Make sure your pet is in confined in a secure area it can’t escape from. Most pet escapes happen during thunderstorms or on New Year’s Eve. So make sure the area they are in is secure.  Desensitise your pet to the Fireworks noise. In preparation for your dogs anxiety towards the fireworks noises, you can start to desensitise your pet to the noise beforehand. Find some firework sounds on YouTube or use the Soundproof Puppy Training app (iOS, Android) (not only for puppies) to play firework sounds while your pet eats its breakfast and dinner, as well as 10x a day just in the background. Keep the volume low until your pet is totally relaxed and almost ignores the sound, and then increase the volume slightly. 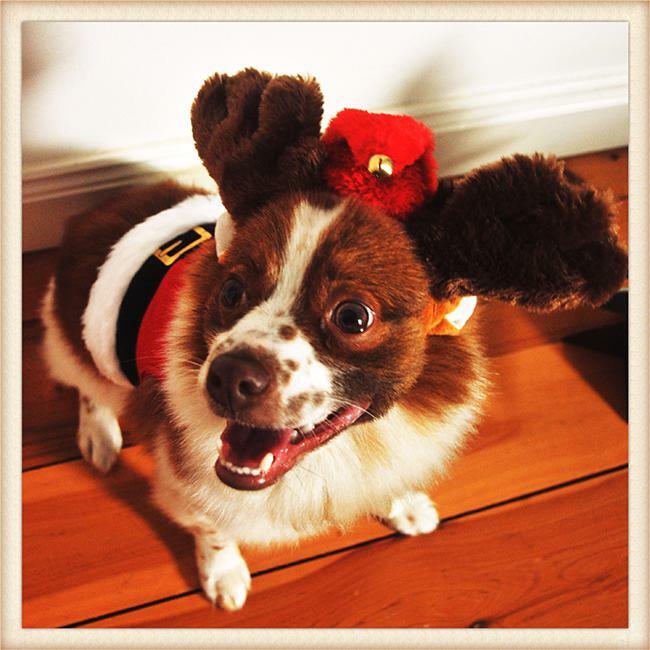 We (including our Mascot Benji) hope these tips will help you to have a wonderful and safe holiday season with your pet. Please share them with your friends and family if you found them useful. Remember, it only takes a little time and effort to ensure your pet will be safe and happy – the last thing you want is having to spend your holidays with your pet at the vet. So enjoy the festive season and have a great time together. Merry Christmas & Happy 2017! Crazy about cats this Christmas? Our favourite buys for cat lovers! 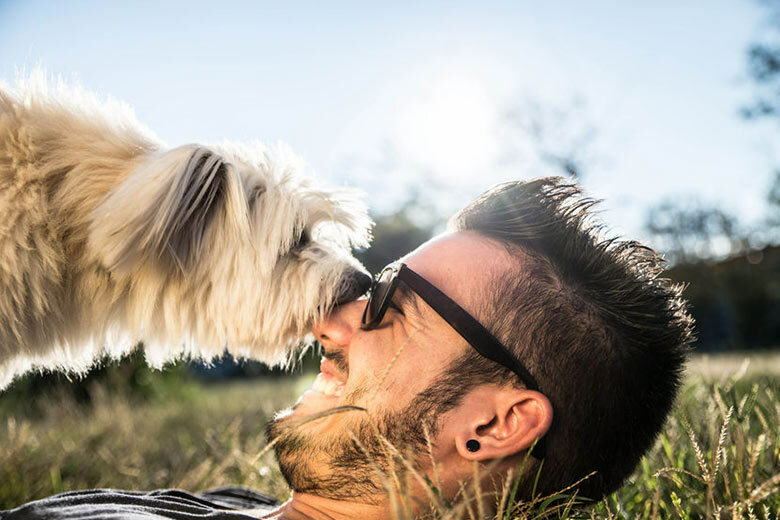 Tips and advice on how to introduce your pet to your… For some pets it can be a real challenge allowing new partners into their life with you, while some are more easy going. 10 Unlikely Celebrity Pets We all have our favourite celebrities, right? We know their movies, their songs and their most famous paintings, but their pets are another story. 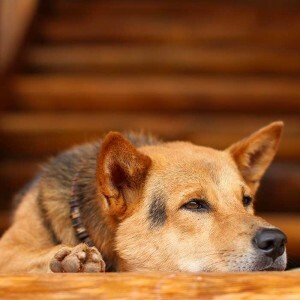 5 Tips To Avoid Separation Anxiety In Dogs Separation anxiety is a serious issue for many dogs, especially the ones that are used to getting a lot of play and attention. 2 months free for puppies & kittens!